This is a html version of the text mentioned below, which I corrected at some places. The corrections are underlined. With regard to family history, the sources which the following text is based on, are the same which I used for this website. But especially in the area of the company A.Schunck in Heerlen some aspects are added. Reason enough to show it here. Of course, you can visit this archive in the Rijckheyt, Coriovallumstraat 9, Heerlen. In order to give you an impression of this page, it is translated by a machine. Because the human needs more time. Come back later, if you can’t understand this translation. 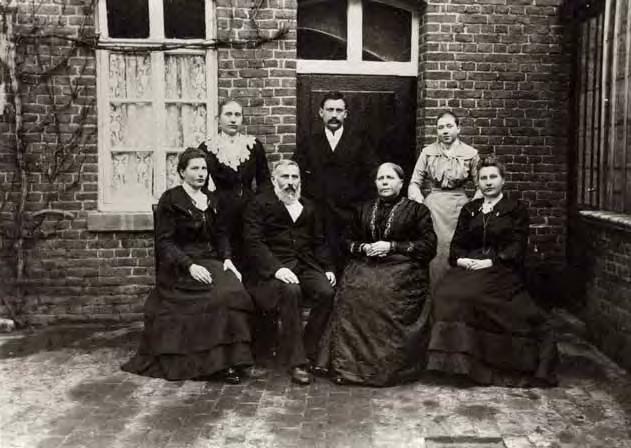 On the history of the family until 1900, and their arrival in Heerlen is little known. In the archive are no pieces found from the earliest period. A large part of the introduction is made ? ?on the basis of the autobiographical biography of Leo Schunck 2) and Articles of Van Hommerich and Schunck 3). Verification has not been possible, since the articles of Van Hommerich and Schunck a citation is lacking, while Leo Schunck in his biography only the stories of tradition was recorded. In 1776 died a Tuchmacher Schunck to Kettenich or Kettenis, in the former duchy of Limburg, near Eupen, 4) while in Bruttich, a village along the Moselle a building from 1662 known under the name Schuncksche’s Haus and around 1650 near Bedburg also family known 5) . Nicola, the elder brother of Johann Arnold worked since 1858 in the textile factory of Delius in Aachen and not as his father wished, in a traditional weaving company own 6). Arnold left that year to Eupen and was there employed in the dyeing of JP Fremerey. Severin Joseph stayed with his father works. In 1860 Johann completed his alleged Wanderschaft, 7) required to Meisterprüfung to retrieve. In late November ended the trip in Aachen.To Kettenis arrived, he worked as a weaver in his father’s workshop. It was apparently bad in the weaving.Several years later, in 1863, he left with two brothers to Russia to, at the request of a Russian lender, an industrial establishment, or close to Bjelostok 8) . In 1866 Arnold moved with his brother Ludwig toHausset , where they are in the empty Kupfermühle yarns and fabrics for industrial and painted appreteerden. In 1873 he was the inheritance of his deceased father in 1865 available. After the marriage with Anna Küppers in 1873 and the birth of Peter in the same year threatened poverty. Anna saw clearly that the company in the windmill and fruitless nor any mechanization. The rise of mechanization and mechanized weaving, including Aachen, meant the final blow for the little hand weaving. Arnold wanted even to America, New Orleans, where a brother exercised the profession. During a visit to Vaals pharmacist Knittel, because of drugs for mother and child, advised him to contact the Rector Savelberg record. There would be Schunck the orphan boys weaver professional learning. Anna, being familiar with the interaction of plants with medicinal herbs would be involved meantime, in 1874, they tried 9) the inherited stock fabrics Sittard to sell, but that in no way succeeded. Well it turned out that Anna has a sales talent, while Arnold had the expertise 10). On the way home they decided to Heerlen to Savelberg to go. He would not even consider the case where Ludwig spoke would have 11) .Afterwards voted Savelberg, after which the Schuncks, 1000 Thaler, 12) three looms 13) and fabrics, everything from the inheritance, arrived in Heerlen 14) and a house in The Schram question 15). There he began a handweverijtje 16). Now he could experience gained during the Wanderschaft which he had investigated what manufacturing (hand or machine) the future might have in practice. One of the three looms was a real heirloom. It stemmed more from the bankruptcy of Clermont in Vaals. Arnold led two weefjongens 17) and his wife led the shop, where she woven fabrics and viii herbs, called Kneipp products, sold 18). The question of fabrics was greater than the supply, so Arnold industrially produced materials to Aachen and Mönchengladbach-Gladbach had to buy. Share to Scha was a small farm with pasture, beside a brook, bought for the weaving activities, which took place in the open air. The wool was bought from the farmers and crops Caumerbeek. By inheritance 19) This building was owned by Christine Schunck, wife of Jos.Franck. 24). Substances were purchased to Mönchengladbach-Gladbach, Verviers and Tilburg 25). The first was tailor Eykeboom. One might conclude draw at Van Hommerich, that the cessation of the wolf-fabrication and making ready before 1882 took place 26) . In 1893, 27) , the building was demolished and flat behind a larger building, to the city wall along the raft built. There was a novelty, namely concrete and plate glass display windows of 2 to 3 meters, 28) applied. The store was temporarily in the old house next café Verstappen, then Lindelauf café, housed. In 1894 the building was apparently ready: it was moved, together with sales. In 1903 another expansion took place 29). The property Verstappen was demolished around 1910. Spot came, according to a design by architect Seely Sr. a new building, the existing store was added 30). Around that time, was the name "Company A. Schunck Hosiery Ladies and Gentlemen Children’s Clothing, Hats and Caps. " 31) Letterheads mention Company A. Schunck / garment factory factories / wholesale & retail 32) . The period between 1890 and 1900 brought Arnold a certain prosperity. He invested mainly in German mining and metals shares in the Aachen region-Eschweiler 33) . 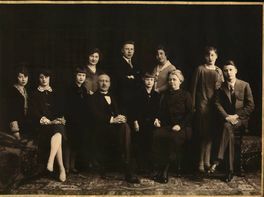 early 1900 was first sales personnel deployed outside the family. They worked internally 34). For 1904, still Arnolds death, the one-man business into a partnership Firm. This allowed the children working Participating be.It was also so happen that on the death of the parents a monastery would share in the inheritance or say in the matter would write, since two daughters wanted to be religious. Arnold was a craftsman: he remained until his death fabrics designs to his old loom. These designs were at last taken by van Moorsel Eindhoven. The weefkamers however, were replaced by tailors. They manufactured custom and ready-made clothing, for men, another modernity. photographed in studio C. Franks in Eupen in 1897. The couple lived at that time more than 20 years in Heerlen. In 1905, 35) on the death of Arnold, 36) 60 people worked at the firm 37) . 8) From Van Hommerich indicates that the three brothers went to Russia, Pierre indicates that Arnold just went along, as supervisor of Nicolas’ wife. He returned after one year back, invnr. 670.Site Schunck calls 4. 10) Nevertheless, "Johann Arnold ....with his business instinct "in Heerlen from town to town, 29. 12) Invnr. 670; 900 Thaler according Van Hommerich 1951 and invnr. 137: press kit. 15) Invnr. 241. That Schunck in Heerlen immediately after arrival was active shows the oldest piece of fa Schunck, namely the receipt book in December 1872 t / m in August 1883. The first part related to the establishment in Heerlen is dated September 1, 1874, and is directed to the merchant Schunck. he placed immediately in the Limburger Coerier 17 times an ad recommendation in the period from 5 September. Until the 24 December The receipts from the two periods are addressed to Johann Arnold or the Limit. Schunck, Tuchfabrikant, usually Hausset . 17) From Van Hommerich 1951 mentions Mustard, Merckelbach and Koolen as weaver, and the boys of Savelberg reel boys, 2 of which were trained as weavers. 24) Invnr. 670. Van Hommerich 1951, 58, believes that the weaving after 1882 still six years has been in operation. In connection with the recovery of the boys Savelberg by the rector, the mill closed. Van Hommerich mentions about the new building only "Around 1900 it was decided to build a new shop near the Church tower. " 27) In 1893, "one seeks more space, also on Church Square, but behind the tower" "the property in possession taken", invnr. 3, 75 - year anniversary. Meant is the new building. From the construction of 1893 and 1894 are preserved invoices, invnr.57. Peter, born 1873 in Hauset, 38), was the successor of Johann Arnold. He led the company together with his mother 39). When he was just a toddler, in 1877, he tought Mgr. Savelberg to flush wool bobbins for the old hand weaving looms. It's told that Peter Joseph, as a schoolboy, sold 25 overalls in one single morning 40) Except Peter also worked three sisters in the store 41). The workshops produced clothing for farmers and miners. In addition there was the hosiery department and homeworkers were employed 42). Peter had several ancillary businesses. On account of the cement shortages during the war, two quarries: a marl and limestone exploitation in Kunrade, and a company called Meerssener Kalkwerken 43). He ran a bus enterprise which owned three busses in 1908 44). Thus Schunck was the first bus operator in Heerlen. The company maintained a service to the surrounding villages and transported clients freely to the store and back home. There was a laundry in Valkenburg. With horse traction Maastricht and the Dutch mining district were served. After the First World War, the non-core subsidiary companies, which are not always profitable were sold 45). Finally, Peter Joseph was shareholder and secretary of the NV Heerlensche Glasverzekering-Maatschappij 46). After the period of scarcity during the war followed in 1918 a further devaluation of the German mark, so that the textile in Aachen many times cheaper than in the Netherlands. Yet the company managed to maintain 47). Late 1920s the business was profitable again and a goldmine despite the competition of V&D and Hollekamp 48). More property was bought in which new branches were accommodated, such as in 1929 a separate beds and carpet shop, afterwards called Käller-Schunck 49). This and the previously mentioned property purchases by his father are demonstrated by the rise of the insurance premiums. February 1904. Possibly the last picture of Johann Arnold Schunck, the founder of the company. Beside him, his wife Anna Maria Küppers. Behind him is Peter Joseph Schunck, his successor, 31 years old. The other ladies in the picture are 4 of the 5 daughters. Next to Peter: on the left Louise, on the right Anna. Next to the parents: Christine and Maria Josephina Hubertina. Elisabeth wasn't present because she was with the Sisters of the Love in Utrecht since July 13th, 1903, under the name Sister Arnoldine. Maria Josephina Hubertina would enter the cloister St. Josef in Brunssum as Sister Emma on August 16th, 1906. 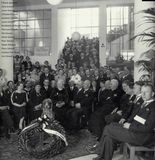 In 1924 the company celebrated its 50th anniversary. Each client received a souvenir gift. A large portrait of the founder decorated the publication, which was produced on that occasion. Photos show an immense sea of flowers in the store. The local press dedicated much attention to the jubilee 50). In the thirties came the decision to close the sewing rooms and to change over to ready-made clothing. The fashion of Schunck was apparently good but old-fashioned. Menswear remained the core business 51). In 1934 the 60th anniversary celebration took place. On this occasion, the staff and the management have been immortalized by photographer Cohnen in front of the theater 52). At the same time, Peter could start the construction of the new department store in the place of the houses which he possessed. Five long years of discussions had preceded and - after a fence of the ”Vuile Hoekje” (Dirty Corner) was blowed over by a storm and after the threat of expropriation - eventually the construction could start. Son Leo had contact to V&D on expert architects. He had traveled the U.S. and Europe to take a look at department stores, while Peter, together with Peutz, traveled for inspiration among others to London and Nantes. Eventually they commissioned architect Peutz to avoid problems with the then mayor Grunsven of Heerlen 53). The famous street issue also played a role 54). Bij deze gelegenheid schonk het personeel een borstbeeld van de oprichter Arnold Schunck aan de directie. After a construction period of about a year in 1935, the Glass Palace was opened. Due to the fall of the iron price it was considerably cheaper to build than originally budgeted. The opening and the reception attracted more than 2000 visitors 55). The staff gave a bust, depicting Arnold 56). The building was a stacking of marketplaces, protected from the weather by a glass coat 57) (The order of Peter Schunck : ”Design a department store like a stacked market next to the market”. For more information, go to the page Glaspaleis at this site). Heerlen now had a real department store, where everything was sold, like any big city. Not an ordinary village bazaar, where everything was for sale too. However, Peter Joseph communicated explicitly that the store was a middle-class enterprise, no department store. Schunck limited himself to his own core business and didn't enter an unknown field 58). Still, the building also had some imperfections. Peters wife Christine provided correctly, that the glass would produce temperature problems and would be uneconomical in relation to the management of the compartments and the display of the merchandise 59). The tailor shop was provisionally housed on the fourth floor, while on the roof the penthouse with the roof garden was realized for Schunck himself 60). Architect Peutz published in leading international journals and thus he put Heerlen on the architectural map 61). The national politics commented disparagingly. While in the mines the work week was reduced to four days, a department store was built: "Only a fool can put up such building in a depression like this. It is a daredevil undertaking ", said Minister Verschuur, who visited Heerlen at that time 62). In 1941 the clothing workshop was expanded with machineries for the trousers department 64). (Read more in the Interview with Pierre Schunck on his activities in the Dutch resistance. There he says among others: „In 1941 the license of the company Schunck in Heerlen for the production of pit working clothes came into danger if no separate production apparatus would be set up. I was asked to take care of the organization (my original profession).“ This way SKIL started - Schunck’s Kleding Industrie Limburg). About 1942 it was decided to secure the family capital. To prevent it would be lost after the death of father (Peter Joseph), some general requirements were suggested. For instance, that the fortune should be protected against any mismanagement; that there should be a separation between capital and prestation; that those who ran the store with the father, should obtain a good reward and a certainty for the future, to continue the business; that the name Schunck should be beneficial to each child in the same way; that unwanted internal competition should be avoided; that everyone should have a chance - when his/her capacity was prooved - to work in the store or to represent the store. Father remained to sit at the steering wheel. In addition to these general requirements it was necessary to take into account the current situation. A collaboration between Leo and Pierre Peter Schunck and Arnold Käller was excluded (Although Pierre was shareholder, he was not in the management of the N.V. A.Schunck). Leo Schunck and Chris Dohmen-Schunck strove to unilateral action without control by the family, which could result lead to tension in the board. Arnold Käller wanted to start up an own business from parts of Schunck, for which both (Leonie & Arnold Käller-Schunck?) received a permission. Due to the scarcity of materials because of the war, the plan was not implemented. Then the city government took over the plan to build the connecting road in which Schunck was willing to deliver a contribution to the costs. V&D also was willing to collaborate. During the construction of the V&D department store (1921) and the Glass Palace (1935) that street was taken into consideration. The company Schunck mediated in problems between V&D and the municipality regarding the municipal sewage system or rather the Vlot. On June 30 1937 the local council decided to impose a construction ban on the ground, which was destined for the construction of the street. Schunck still was prepared for a financial contribution for the road construction. Afterwards, it would appear that in the building plans of V&D a passage was included, so that te city government would not be obliged to build this road. V&D on their part contacted Schunck to build in arrangement a connection between the planned V&D passage and the existing V&D passage. In 1939 Schunck prevented the municipality to sell to V&D a strip of land called the Vlot, which was the access to the passage of Schunck. The municipality of Heerlen eventually sought a settlement in the direction of a pedestrian passage instead of a road, because of the associated costs. It could not be expected, V&D would cooperate anymore, which was evident in 1939 and 1940. All atempts to negotiate by Schunck led to nothing. Schunck himself got the impression that the opposition of V&D arose only after the construction of the Glass Palace. Finally Schunck asked in his letter mentioned above of 1945, whether the City Council would be inclined to build the connecting road with a financial contribution of Schunck. Father wished however a just settlement for all his children. Because of her merits, Chris would become full authority in Geleen and get the succession there in their own hands. For this reason in Geleen an NV was founded, whose shares she could buy with her shares of the NV in Heerlen. Leo would become an inviolable position in the NV Heerlen and a dominant position which safeguarded the succession of his descendants. Pierre who had stepped back before to not disturb the cooperation in the board wanted that his position as the oldest son wasn't lost for his children and claimed the same right of succession as Leo. The problem Pierre - Leo could be solved by certification of the shares of their father in the NV in Heerlen. Eventually a thing specified in the instrument of limited partnership (CV), which Leonie Käller-Schunck, Josephine Stahl-Schunck and Joseph Peter (Pierre) Schunck were granted the right to join as a partner in the CV, if for 1 January 1946 a capital paid had 65). Something isn't correct here. Is it here Peter Joseph (Peter) or his son, Peter Joseph Arnold (Pierre)? Only a few records show the activities, especially of Leo, during the war and the period immediately afterwards 67) (NB: 1] You are reading the introduction of the Schunck Archive, not just about te business, but also private, as it was found in Leo's house after his death. 2] Heerlen and its surroundings were liberated in september 1944. A.S.). In June 1944, a journal of a committee for more and better plastering reported detailed on the shop windows of Schunck, where stucco was used and where the dolls wore historic XVIII century costumes 68). During the Second World War the Glaspaleis was struck three times. After the war (so after sept. 1944, until 1945. A.S.) it served as HQ for the US generals Patton and Simpson, and as a rest center for the Americans and the French resistance forces. Only after 1945 a clear growth started 69). Nevertheless, already in 1945 Schunck attempted to get a solid toehold in Maastricht 70). In 1946 it became clear that expansion of the store was necessary. For this, the property Logister would be needed, which only 1960 could be bought for 2 million guilders 71). In 1949, the Glass Palace served as a shop again. In that year, the 75th anniversary celebration was celebrated. The Executive Board, consisting of P. Schunck Sr., L. Schunck and F. Dohmen, did things in style. A beautiful flyer was produced with golden letters and photographs, including some prints, which were already used on previous anniversaries. Peter Schunck was described as the founder of the new store, while Arnold was called the founder of the company. The staff offered a bronze bust of Peter Schunck, created by Charles Voss. There was a great jubilee fireworks called Schunck’s triumph fireworks, dedicated to the whole mining district. There was room for tens of thousands.The preserved telegrams and congratulations give a good picture of the relationships of the company and of the involvement of the population in the event. Of course the local press spent much attention to the week of the anniversary. At that time, there were working 300 employees 72). In 1953, the Market Hall opened with a (for Heerlen) totally new concept, called a base department, with a self service 73). In 1954, Peter opened a branch in Geleen 74). Photos witness of the magnificent windows 75). Still when he had reached a ripe old age, he could be found in his store every day 76). July 13, 1960, one year after the death of his wife, Peter Joseph died 77). He was called an active and noble man 78). Because of his prestations and his foresight was Peter in 1961 called "Peter the Great". He was indeed the central figure of the business center of the mining district, a daredevil, seer, by the Glass Palace showed that Heerlen became a metropolis 79). He was a man who took no excessive risk, says Leo in 1964 80). At that time  a total of 400 employees worked in the Glass Palace and the establishment Geleen 81). 53) Invnr. 495, biography; invnr. 3 papers 75th anniversary. 63) Invnr. 155, item 1939, which also describes the Vlot Issue. 68) Recorded in invnr. 89 For photos of the shop windows consult the index. 81) Invnr. 36 Interview 1969. Pierre was the eldest son, but not the successor of his father. He was director of the steam laundry in Valkenburg. That company, the Dutch NV Stoomwasscherij, 82) located on the Plenkert in Houthem, was founded in 1904 by Pierre Cloot in Heerlen 83). The energy was generated by a portable. In 1909, Pierre owner (at age 3? Here swaps the author PJA Schunck with his father, Peter Josef Schunck. Pierre was director on behalf of his father in the thirties. Arnold Schunck ), while Leo Cloot as director acted 84). That year, the company expanded and became the Locomobile replaced by a steam engine and an electric motor 85). The role of a certain J. Imink to Elden is not clear. It seems that he had something to do with the laundry 86). In 1910 NG Brey as the agent listed. He was still active in 1914 87). Apparently things went well. In 1913, staff requested, namely a nanny and ironing esters 88). Pierre interfered only with family matters for the sake of continuity and unity, but did not the cheese of bread 89). Pierre Schunck did around 1950 recall that the stable collection of Arnold after his death was stored in the attic, along with the old loom. This attic was also named the relics attic. Access was allowed to nobody, except widow Schunck. At the start of Pierre’s study on the textile school he visited with his mother in the attic and found the steel and the loom under a thick layer of dust. In 1926, after his study, Pierre wanted the loom operation and the stable collection organized. The books which were given to the paper and the loom was cut into counter trays. The warp, the reed and shafts had gone to the ragman. Apparently there was additional warehouse space was needed. It was beyond Peter Schunck and his mother went to .... They were kept unaware of those events 90). After the laundry in Valkenburg, Maastricht Pierre had the Men’s and children’s magazine Schunck Jr..CV, located on the Muntstraat, which apparently was run in 1970 91). 82) In 2002 the inscription can still be read as vague mural on the house. Some Citizens of Valkenbug informed me that the brewery was owned the property by now and it would possibly be demolished. To what extent this story is based on fact is unknown to me. 89) Invnrs. 9, 11, 41, 56. He was born in the old building with the tower on April 12, 1910. On the flat roof he loved animals and he rode on his children’s bicycle. Leo often played on the castle Haaren and Hoenshuis to Voerendaal, owned by his maternal grandparents (Cloot). There, in the garage of the military police horses was probably his interest in horses. He went to the nursery in the Klomp Street, the primary school in the Nobelstraat and the preparatory year at secondary school. He then became the Episcopal College Weert placed, because his parents had connections there. Leo followed the trade school students between the priest. Rather, he went to a boarding school in Belgium or to Rolduc. Finally he took the Higher School of Textiles in Enschede. After graduating he worked in the case of his parents, and he was 18 months compulsory military service. He followed the officer under military administration to the Chasse-barracks in Breda. In the nearby Julianakazerne he practiced his hobby horse. As part of his training he ran nine months internship at garrisons 92). In the beginning, he helped clients in the matter. In the thirties, when Peter decided to sell clothing, Leo was head of procurement and was consequently much traveling. He was a board member of the purchasing organization Fame in Amsterdam, which Schunck was the largest participant 93). In 1944 he worked for the National Office for distribution by the textile trade (Distex). Later, he was Liaison Officer in the rank of 2nd lieutenant in 13th. Reg.Infantry, part Headquarters 94). In 1945 Leo was apparently director, at least he signed a letter, as director 95).In 1960 he succeeded his father, and he formed with Chris Dohmen-Schunck two directors 96). 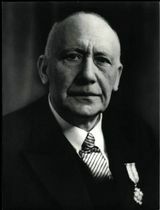 The Leo Schunck era was characterized by a continuation of the line of his father with a rapid growth followed by stagnation and finally sale of the company. Like his father, he brought great showcase devices. He tried even a lion dressage to win 97). In 1961 worked in Heerlen between 480 and 500 and in Geleen between 120 and 125 persons 98). The street issue was the oldest case of Heerlen in an unfavorable competitive arrived. New business had established itself in Heerlen. Mn Grand Bazar proved a formidable competitor. V & D had a modern new building. For Schunck turned aside the new Glaspaleis not possible. The outdated decor could not be renewed, it no longer met the requirements of a modern department store. There were increasing expenses incurred in connection with the decentralization due to the lack of space in the Glass Palace. To the lack of space to turn, the buildings were Saroleastraat 14; Markt 1, Kerkplein 11, 12, 14; Bongerd 14, 16; Emmaplein 17; Kerkplein 1; Emmastraat 13 uses 99). Eventually could be built, not according to the original plan near the Glass Palace on the Bongerd, but “to break&Rdquo;, where a new shopping center was realized 100). It also meant the end of the protracted street matter. Leo made ? ?extensive study of the new supermarket being and on traveling including to Sweden and America. After a construction period of only 1.5 years in the first southern Dutch shopping boulevard metropolitan allure, on 16 September 1964 the new shop opened in the presence of Governor and Mayor Gijzels Rooy. The opening led to traffic chaos 102). In his opening speech, Leo could not refrain from pointing out the "almost insurmountable bureaucracy." 103) In the new case were all new articles available. In the basement a self-service supermarket, 104) on the ground floor: a department with paperbacks, stationery, pastry and confectionery, perfume, bags and leather goods, on the 4th floor finally the department furnishing fabric and a lunchroom 105). The costs amounted to a fl 30000 000 guilders, but it was also the largest home-were in the southern Netherlands 106). After modernization would in the Glass Palace Schuncks furnishings are housed. After this, a reorganization and restructuring of the remaining buildings place 107). The Market Hall in Neerlandia Saroleastraat was extended to the former Limburgia the Bongerd. The Market Hall was designed as a self. The beds and blanket sale of the former Limburgia building was moved to the Glass Palace. Demolition of buildings on the Emmaplein, namely the property Savelberg, the old cafe Lindelauf and plots, which at that time the furniture was placed. Demolition of all buildings acquired after 1945 and between Bongerd Kerkplein, namely the former Hamburger Buffet, building Stienstra, property and hotel Keulaerts Cloot. In Heerlen, the company had 700 men time staff, in Geleen 125 108). in 1965 celebrated its 90th anniversary. In the 13 windows of the new building was the old boardwalk Heerlen realistically portrayed through paintings, produced by the window dressers in cooperation with the municipal archives 109). With branches in Geleen (Highway South, warehouse), Heerlen (Marktstraat 1/Saroleastraat 14, Market Hall, retail trade in textile goods), Kerkplein 5 (retail furniture, home textiles, garden, reed, and camping furniture, oriental carpets and furniture and housing upholsterer company) was Schunck an important entrepreneur. In 1969, Leo in an interview some views on the policies and the future. Large and small specialized companies had the future. Those who are not specialized, had no future. Schunck was a specialist, and the power lay in the personal ministry of the clients. Cooperation plans, ie cooperative were not there, but were not rejected. The supermarket ran well and got national recognition. The motto was: quality always wins. Schunck came with weekly specials: an island in a sea of loss of profit. Schunck is a department store, but emphasized the bedarfsbündelunggedachte: no shop in shop, but a case where the right supplies could choose the desired product [as usual] in a glasshouse according to the fashion of traditional departments. Central to this was the personal ministry. Cash and carry this country would not be long lived. They would probably be turned to the American discount house, which Schunck 15 years earlier been realized in the Market Hall. The Promenade-new building was teething overcome. The new supermarket departments and catering industry flourished. Schunck used an electronic information or computer system 110). Like his father was Leo thinking of business expansion. From 1969 to this was hard. Leo would possibly in conjunction with or through a Holding with the Grand Bazar Schunck expand, whereby, a possible management of Leo Grand Bazar Netherlands and the president-director of Schunck in the offing would lie, while son Peter a executive chair in the combination-Schunck Grand Bazar Netherlands envisaged. There was even a step towards a Schunck Netherlands. Gradually the plan began Leo, like his father, to take early action to secure the succession. Initially, he thought his son Peter. To Schunck empire to his ideas to expand, it was necessary, in possession of all the [family] shares. These could then be inserted into a still forming cooperation partnership in which an intended successor also a function would get. He would continue to work until retirement age. To ensure continuity and follow-up to ensure, in short, the family business afloat for the next generation, he was willing to great financial sacrifices. The shareholders saw this with sorrow 111). Unfortunately stakes around 1969 various external factors on the head, which were not foreseen. In 1969, problems arose with the sales, partly due to the introduction of VAT. In the mining area were German visitors back. Mines were closed, incomes fell by as much as 20%. There was a huge surplus of retail space in Limburg: almost 40% of the floor area in South Limburg was to disappear. All this would eventually have major consequences for the firm, which Leo and Mrs. Dohmen for several years before had predicted 112). The subsidiary NV Wassen was April 15, 1969 sold to NV Vinke 113). A reorganization made ? ?the supermarket profitable again. There was an aggressive sales policy. Due to the poor results of the department store was divested to the supermarket Coop South Limburg. This company opened however Schuncks Supermarket near a discount store, the supermarket which many customers lost. The loss of parking spaces by the realization of Promenade II was for many causes customers to Schunck Supermarket to ignore 114). in 1970 was related to the insurance a sprinkler system to be built and the sale was seriously disturbed. And although the turnover compared to 1969 increased, was unfortunately in 1970 an even greater loss. The causes of the losses were too few sales and soaring wage data 115). For all its merits, the realization of the Glass Palace in the difficult years and for his interest in the cultural life in Heerlen, said the mayor, was Leo appointed Knight in the Order of Orange Nassau 116). It was recognized that the necessary revenues to return a profit to work could not be achieved, particularly as a result of the decline in the mining industry, the overbewinkeling of Heerlen, the enormous competition, Stay away from the German customers and the exodus of people from the mining area. To turn the tide action would be taken. Chris Dohmen-Schunck and Leo would put things in order: in the lunchroom, the bakery closed, the bra utensils should be looked at, there was in fact no insight into the bra utensils, while "Käller money like water ’in the window / publicity, the position of the chief window dresser in reconsidered, in the order administration three forces would disappear. These records should be performed on the computer, the staff was to be investigated. For people who failed a solution was sought. However, advisors came to the conclusion that on the matter of decoration and efficacy much to criticize was that "this can not make money. ... ergo, cooperation by the Beehive rejected, a negative result is a foregone conclusion. Schunck can best liquidate, to avoid an even greater loss. " 117) The estate was out. Banks stated requirements for any assistance. Thus, a new SA Schunck with a new owner to come. The old SA would consist of the Market Hall and glass building with possibly the cinema. The branches Heerlen and Geleen would focus on clothing. The cinema, supermarket and lunchroom would be rented out to third parties, where a merger with a third were considered. Also served the business to be reorganized. An independent advisers did not go down 118). diligently sought a partner, where the continuity of Schunck and guaranteed employment should continue. Fa Kreymborg and Etos were initially candidates to parts of the building to rent, but a third party was not found. In February 1972 found the first contacts with V & D location. V & D would be building on the Raadhuisplein leave and wish to convey to the Promenade, where redundancies were unavoidable 119). In 1972 the knot. The Glass Palace was leased to the ABP, the hasty sale also represented losses 120). But V & D fished behind the net, because ultimately wanted Chris Dohmen-Schunck the case continue, if it had all [Leo’s] shares possessed.She bought all the shares of the family, in return asked her personal assets as collateral, making the loan to the bank remained. For the latter, she even went to the Ministry of Economic Affairs in The Hague gone. She was now 65 years all owner and director. Leo was fired and went prematurely retired. As of May 1, 1972 Leo explained his position. From then joined Chris Dohmen-Schunck as director, while LF Verleisdonk was appointed Deputy Director. Leo retained an option to the Market Hall 121). Many mourned with Leo along 122). In a letter to and classmate of the textile school gave Leo not only economic factors, but put the own hearts for the decline: the case was made too large, he had to stay in the fashion and therein to specialize. The store could not compete with the competitors. Service Departments as curtain dressmakers and decorators were too big and too expensive, and the delivery service, computer and management. Droopy he thought of the carefree life back, since his studies were the only worry ... 123). July 14, 1972 by Leonie Maria Christina Dohmen-Schunck following the decision of the General Meeting of Shareholders of 24 April 1972 the notarial NV converted into a limited company with limited liability 124). Leo’s attempts in the previous three years, in order to save the company - by all (family) shares to buy, merge or collaborate with others - had failed. Actually, he saved the company by not to hold on to his concept, but by its shares 125). Of the fate of the BV after 1972 are no records have survived. ABP in 1973 the new user of the Glass Palace. Later showed the town of Heerlen interest in the property 126). Verleisdonk opened a new store, a specialty store for ladies garments, located at the Town Hall 23-25 ? ?in Geleen. The old store was out of the barrel hit and was abandoned, which meant dismissal for a number of staff. In 1984 the company celebrated the 110-year anniversary, the book "Heerlen from town to town" was issued, stating, that the firm next Verleisdonk and Chris Dohmen-Schunck also a son of her led 128). Because of the continuity of the company sought Schunck connection with a strong partner. In Berden, this partner. In 1989 there was a furniture department of Berden on 6000 m2 in the department store Schunck. In 1995, Berden the entire store, including the establishment Geleen and all goods, over and - importantly - the name was retained Schunck: Berden-Schunck. From that moment led Paul Berden the matter to the Promenade 129). Although a disaster year, meant 1972 not the end of Leo’s business career 130). He remained consistently apply for a job and tried even businesses to buy or another company to start. In addition, he blew trading AKA new life 131). Astonishingly succeeded Leo the Market Hall to purchase. Finally he led with his son Peter Peter Schunck BV and the Administration Office Peter Schunck BV, accompanied by various collaborations. From 19 September 1972 to 1 March 1981, Leo Director Peter Schunck BV 132). Finally, he was patron and board member of various associations 133). On February 22, 2001 died Leo in a nursing home in Valkenburg 134). Leo is on the doodsprentje described as a charming person, a huge bon vivant, with attention and help for everyone, a purebred Heerle To, active in associations, who after his retirement he devoted his time to his favorite hobbies. Comes from the same archival image to the front, as mentioned before. Even after his retirement Leo further in the business field, at least until 1990, while he was still in 1988 applied for 135). For all its merits, Leo, like his father, distinguished. 100) The current Promenade. Through acquisitions and exchange with the municipality, invnrs. 105, 124, 125, 129-141, especially 133, the plan was realized, which Heerlen got a new center and Schunck are new. Old buildings were demolished, including a block on the Wall Market and near the church, invnrs. 124, 153. 106) Invnr. 137, giant in the South. 113) Invnr. 203, CPC Director for Marie-Thérèse, Chr. H. Meijer-Schunck, 1972. 115) Invnr. 22 Report 04/01/1971; dated 07.04.1971; invnr. 489, letter of Leo dated 04/22/1972, final. 120) Invnrs. 25, 101. A characteristic of a family business: the family works in the business. 127) Invnr. 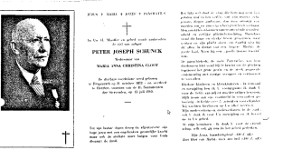 203, undated newspaper article "Schunck Geleen on new paths"
128) Refer to bibliography. Again a puff of a family business: family members are involved. 129) Berden, A historical research. 130) In relation to the privacy of Peter Schunck, can not go into details are entered. 133) Reference is this human bundle of Leo Schunck. 137) With regard to privacy, the modest about Peter after 2043 public. The paper mass, found in the house of Leo, was a company store, a family archive and a collection, 138)documents, cutting, photographs, objects, etc. There are also documents found an earlier period, namely in 1828, 1849, 1854 and one thousand eight hundred and eighty-four. 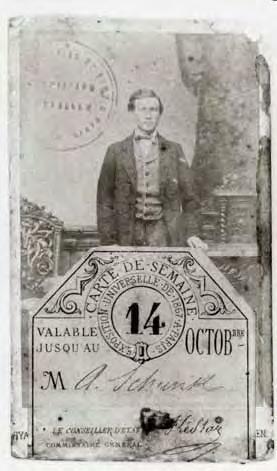 one hundred thirty-nine) These copies of documents, which may be related to subsequent purchases, or in connection with the border dispute and ownership of the street. The oldest part of the Company Schunck dagtekent December 1872, namely the receipt book, which runs until / m in August 1883. The first part related to the establishment in Heerlen is dated September 1, 1874, and is directed to the merchant Schunck. Sadly missing pages in the period December 1872 to March 1873 140). The last piece Schunck BV dates from 1973. The latest documents from the archives dating back to 1997 and include private documents. 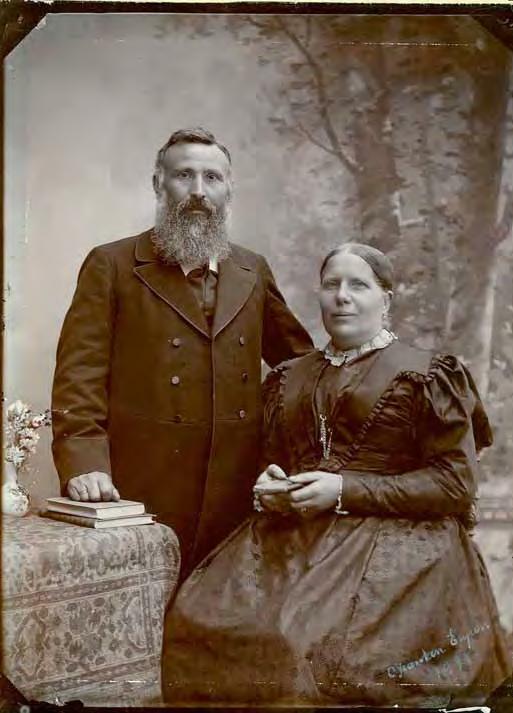 Uniquely, the collection of photos, the oldest copy a ceremonial photograph of Mr and Mrs Arnold Schunck, created in 1897 in Eupen. Important are the photographs related to the construction of the Glass Palace and especially of the window devices. Unfortunately, not always carefully handled with the photos, according to the found old warped pages of pre-war photo albums, which were re-pasted, whether or not known adhesive albums. The Library of the Municipal got in 1958 loaned book back. 141 ) between the collections and archives of Leo Schunck were found pieces of Leo Schunck as commander of the Sixth Infantry Regiment, I. Battalion, I.Company in Breda (Compagnie administration), from the time that Leo Schunck his military training followed.These pieces are not included in the inventory because they basically belong to the archives of the Chasse-barracks or defense. Since Schunck archive on loan is the archival included, will be presented to the family, these records over to defense. Since the found pieces of a beautiful picture of the efficacy of Leo during his military service, are the descriptions of the documents listed in Annex 2 behind the introduction included. The occurrence archive was disordered and included a lot loose, besides bound documents or documents dust folders or binders and much newspaper articles, whether or not affixed. There were also curiosities found, such as horseshoes, medals and delft blue wall plates 142). The most beautiful part concerns the silver shield, that Leo was carried in his capacity as patron of the militia 143). From the medals of Rapid, as stated in the newspaper, nothing found 144). The storage of the archive was far from ideal. From some boxes was the content affected by feeding mice and mice urine. It condolences on the occasion of the departure of Peter Joseph in 1960, happy is a register preserved. By moisture and water damage were many documents go moldy, so it was decided to inventory before proceeding, the documents to be irradiated with gamma rays, in order to destroy fungi and spores. Unfortunately, there are few business records to be present. From the period before 1960 are mainly plastering found relating to ownership, possession and rights. They are typically those pieces found in each family archives can take. At operating area, there is with the exception of the invoice book and advertising, little detected. The encountered financial records are far from complete. Proportionally there most of the time Leo kept. Again little company archive found. In the seventies, a mix of corporate and private archives occurred, especially with Peter Schunck BV. In a family business will be inevitable. Private equity in the company was inserted, causing the boundary is difficult to draw. 140) Invnr. 241. The receipts are apart with adhesive also with pins put. These pins are not removed. 142) Including reminder wallplates 150 years from 1844 to 1994 and market Heerlen Bundeskönigschießen 1985 Bergisch Gladbach. There does not seem there to have been a systematic administration. Over the period 1941-1965, the documents stored by subject matter into folders. Over the period 1960-1970, many loose pieces found partially the pieces in the fabric folders complementary. Noteworthy is the large amount detected duplicates on the street matter. In the collection is a part of Leo’s library preserved. Possibly the better works based upon the family. The Wanderpaß would in 1964 in the museum of the town site, but in his obituary he mentions that this pass still in his possession 145). About Do you get the whole, it appears that the so-called Schunck archive actually the archives of Leo Schunck is obtained partly from his grandfather and father, while Leo successor, and partly executive archive, but meestens private administration. The pieces from the period of Leo are made ? ?or received by Leo, by virtue of his position at the firm. Summarizing, we can say that the actual company archive is never transferred. Then in January 2001 Leo Schunck went to a nursing home, the family was the city archives approached with the question whether there was interest in the archive. The city archivist found in the premises of Leo, located on the Franciscusweg total of 12 linear meters of paper, stored in the house, from the basement to the attic. 146) Thus ended 20 boxes in stadsachief, taking RPAL Schunck one contract of bailment was closed for at least 10 years. 145) Invnr. 137 explanation painting; invnr. 495, life sketch. The Wanderpaß is certainly not found in the archive.For understanding Wanderschaft please consult note 5. 146) The Limburger of 1 and 2 March 2001; Trumpeter March 7, 2001. Not all information herein is correct, see "the oldest ....... A yellowish A-4 sized page, .... 1873 "by Pierre Schunck. In particular, the latter documents were a welcome addition to the initial period. Arnold also came up this new facts. Until then, the twentieth-century holdings unknown. The received documents from the period 1890-1914 and are included and integrated into the inventory. As mentioned above, most documents created or received by Leo Schunck. As already mentioned, in the course of time the archives of many companies, the family and the personal archives of Leo Schunck become mixed.While there is a large amount of documentary material - newspaper clippings, photographs, etc. - is found, also mixed with the archives. Archive Documents belonging to an archive of one of the many companies of the family Schunck in the inventory transferred to the relevant business records. The records belonging to the family archive Schunck by mixing with the company archive, by inheritance or by deliberately collecting these pieces by Leo Schunk in the archive ended. It was decided that these records as much as possible to accommodate the person or persons to which the documents relate. There are also major gaps identified. Due to the large mixing of archival and documentary material and practical reasons, it was decided the documentation, such as photographs, newspaper clippings, brochures and graphics as a separate section to record but to accommodate within the archives themselves. Partly, this material the archives, where large gaps are observed, somewhat complementary 147). The archive schedule for the company archives was derived from the inventory of the business archives of Henry Beaumont’s metallurgical NV and that of NV Philips light bulb factory 148). As a result of the interdependence in the 1970s took place between private and business archives, especially with Peter Schunck BV, the archive documents, focusing on private affairs, housed in the family archives. Leo Schunck was during his life involved in various foundations and associations , as a member, board member or patron. The associated documents are in separate sections housed within the personal collections of Leo Schunck. Renumbering of the descriptions in the inventory is omitted, since it is not inconceivable that in time even records and other material from the family Schunck offered, in the same inventory can be described. For the selection of destructible records are consulted the "list of destruction eligible records from the archives of municipal and inter-municipal bodies, dagtekenende after 1850", established in 1983 and Meerendonk Guide to the selection and destruction of records 149). The inventory clerk has several, for destruction of eligible records kept. As main reasons are to bear the historical importance and the presence of gaps in the archive. Thus the private archive of Leo Schunck many financial documents incorporated actually voidable. Because these documents, however a large period and include insight into the private assets, they are included in the archive. Consequences may be, after the documents are public, conclusions about alleged wealth of a meritorious Heerle In. Following the selection of the 12 archive approx 9.75 m1 m1 qualified for permanent preservation. Benefit of a good research in the archives Schunck is advisable to read the introduction. Searched topics are best approached from the index and the relevant section (s). Additional information in other sections can then be found through the automated search capabilities on the website or in the reading of Rijckheyt, center for regional history. Pieces, younger than 50 years have not been consulted. In connection with the protection of the privacy of individuals, the following files made public in 2043: inv. Nos 25, 27, 47, 139, 377, 378, 379, 380, 409, 413, 654, 657. Inv. No. 139 is only to consult with the permission of the archivist. Berden, 100 years Berden. A historical research, in: Berden anniversary journal 100 years. Krull, J. (Red) Weaver Arnold Schunck in: Krüll, J. (Red) Village Figures, honorary citizens and dignitaries. The city archives on residents of the 2000-year Heerlen, Heerlen 1998, 65-67. Leonie Maria Josefina (Leonie) born 1911. They married in 1936 Edward Arnold Käller and gets him three children: Eddy, Peter, Paul.